With its crystal clear warm waters and diverse marine life, Thailand is one of the dream destinations for scuba divers. The average water temperature is around 28 degrees Celsius (82 degrees Fahrenheit) and visibility is typically very high. The best time for diving is from October to April with March and April typically offering the best opportunities for spotting rare passing fish. Now the big question is what the best scuba diving sites in Thailand are. Let’s check them out now. This is diving site deserves the number one spot for offering a huge variety of attractions. The rock in the shape of a horseshoe, which breaks the surface when the tide is low, is absolutely stunning. The main attraction are the huge whale sharks followed by barracuda, batfish and mantas. There are lots of colorful tropical fish and gorgeous seahorses too. If you are in macrophotography, you will undoubtedly have the opportunity to take great shots of ghost pipefish and frogfish. A few technical details which you need to know. The site is 120 miles (200 kilometers) north of Phuket in the Adman Sea. Sometimes, there can be strong currents, but you should be perfectly fine with an experienced guide. You will certainly need more than one dive to explore all the beauty of Richelieu Rock. This diving site boasts with a 200-meter reef and one of the biggest drop-offs in Thailand. The rock pinnacles are home to exotic and beautiful fish, soft corals and anemones. It’s also possible to spot manta rays, big barracudas and sharks. Along with nearby Hin Daeng, the spot is among the most popular in the country. 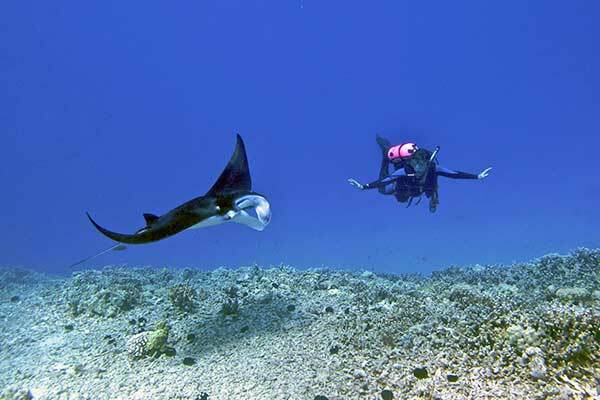 They are around 44 miles (70 kilometers) off the coast of Ko Lanta group of islands. If you want an absolutely breathtaking underwater experience, you should not miss to dive at this famous site. The soft white corals with colorful parrotfish and rainbow runners around create the perfect setting for meeting sea turtles, eels, sea snakes, wrasses and leopard sharks. This diving site is actually off the coast of the southern-most island of the Phi Phi group, which is about 14 miles (22 kilometers) away from Ko Lanta. As the name of this diving site suggests, it is home to a set of pinnacles. One huge pinnacle is surrounded by a series of smaller ones. You will discover gorgeous branch corals and anemones and a wide variety of fish including batfish, snapper, trevally, groupers, lionfish and barracuda. You may meet manta rays, whale sharks and young bull sharks up close and personal. This site is just 3 miles (5 kilometers) off the coast of Ko Tao island in the Gulf of Thailand. Both diving sites are enjoyed by visitors of Phuket as they are a short boat ride away from the island. In fact, Racha Yai is the most popular site off the coast of the island. Its rocky reefs are home to forests of hard coral which are utterly beautiful. With its huge granite rocks and stronger currents Racha Noi is more appealing, but more challenging at the same time. That is why it is recommended for more experienced scuba divers. Both sites give you the opportunity to swim along lagoon rays, jacks, tuna and even mantas and whale sharks. This limestone rock holds lots of hidden treasures including mystical caves. The reef is formed primarily by yellow tube colors which act like magnet for divers. Do not miss to watch out for moray eels as they come out of the reef frequently. You will most certainly meet octopus and turtles. Among this diving site’s attractions, you can also find leopard sharks, whale sharks and small nurse sharks. It’s off the coast of Phuket and is easily accessible. This is actually a small group of islands offering six different diving sites which are very close to each other. While enjoying the drop-off and swim-through areas, you can meet jacks, tuna, ghost fish, octopus, turtles, manta rays and eagle rays. If you are lucky, you may even spot a whale shark. The most attractive sites of the group include the Lagoon and the Cathedral which are popular with beginners and the Chimney. The island group is 25 kilometers west of Ko Lanta. This is the longest wreck in Thailand and definitely deserves to be among the top ten diving sites in the country. It had been used as a navy ship for over five decades and was eventually sunk in 2012. This makes it one of the newest attractions for divers too. It is more than exciting to explore all sections of the ship. There is rich marine life too. You will discover gorgeous corals and schools of tropical fish. The site is easily accessible among other things. The speed boat trip from the nearby island of Ko Chang takes just half an hour. The park is known for its beautiful reefs and has lots of great diving sites. You can spot batfish, sting rays and turtles if you dive at Sail Rock. Koh Pung offers a blend of colors thanks to the soft coral living there. You can also meet octopus, pipe fish and manta rays. Stonehenge is another major attraction. Barracudas and whale sharks often swim in the waters around the impressive granite pinnacle. It is home to honeycomb morays which can grow very big. The park is in the Adman Sea close to Ko Lipe. This is one of the major attractions of Anemone Reef near Ko Phi Phi. The cruiser, which sank in 1997 with no life loss, has now turned into an artificial reef which is absolutely stunning. You will undoubtedly love the setting with colorful fish swimming around you. This site is known for its strong currents so it is best suited for more advanced divers. It’s time to explore the best diving sites in Thailand. When making a choice, consider the time of year and your experience as a diver to have the most perfect experience.